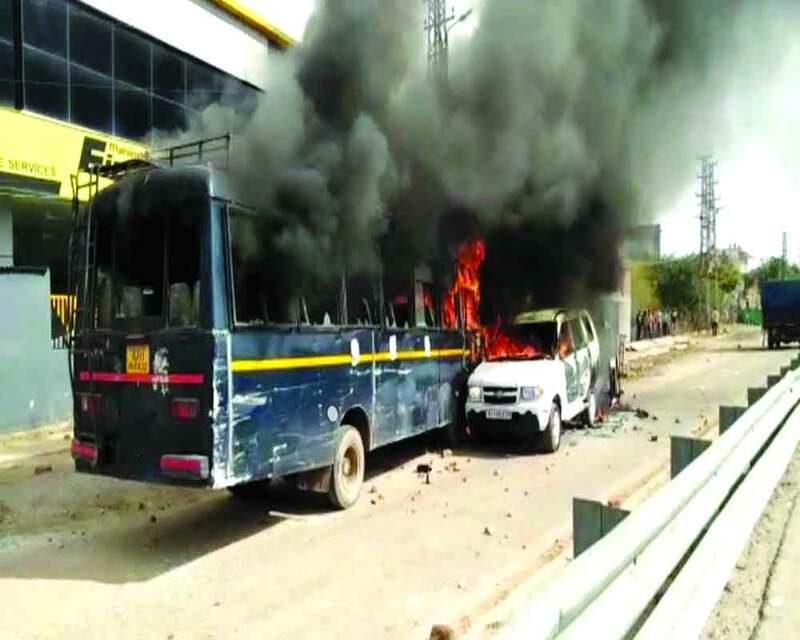 The Gujjar community agitation demanding five per cent quota in jobs and educational institutes turned violent in Dholpur district on Sunday as shots were fired and three police vehicles torched. Unidentified miscreants fired 8-10 rounds in the air while the blockade on the Agra-Morena Highway was in place, Dholpur Superintendent of Police (SP) Ajay Singh said. The agitators set afire three police vehicles, including two jeeps and a bus, he added. The SP said the protesters also pelted stones, injuring four Army jawans, adding that police had to lob tear gas shells to disperse the crowd. Gujjars are holding a sit-in protest on rail tracks in Malarna Dungar of Swai Madhopur district from Friday evening. The agitation spread as Bainsla refused to call off the stir. The agitation has affected the train movement in North Western Railway (NWR) and West Central Railway (WCR) zones of the Indian Railways causing inconvenience to common people. The agitators have now started blocking highways connecting major cities. The Rajasthan Government on Sunday pasted a notice at the residence of Gujjar leader Bainsla — who is leading the protests that turned violent in some areas and saw rail and road traffic being disrupted — warning him against violation of court directives on agitation. On Saturday, a Government delegation had met Bainsla and his supporters to hold talks, but no agreement could be reached. Bainsla has said that the community will continue their protest demanding five per cent reservation to the Gujjars, Raika-Rebari, Gadia Luhar, Banjara and the Gadaria communities in Government jobs and educational institutions as promised by the State Government. In the notice pasted by the Karauli district administration at Bainsla’s Hindaun residence, it has been stated that Supreme Court and different high courts have on several occasions directed that no public or private property should be damaged and rail or railway traffic be disrupted during any agitation. “If the Supreme Court and high court directives are not followed, you will be held responsible for contempt of court,” the notice said.